Thin-film and interface properties of organic semiconductors are among the most prominent aspects with regard to the overall performance of organic electronic devices. The interface formed between two organic materials can influence the electronic and optical properties of organic electronic devices by determining the growth mechanisms, morphology, defect density and the electronic interface structures of organic films. The impact of the relative molecular orientation at the organic/organic interface on the performance of organic solar cells is one of the less understood factors and thus, it represents an outstanding opportunity for research and technologies based on the control of the local molecular ordering of the organic molecules in donor/acceptor organic photovoltaics. Using state-of-the-art scanning probe microscopy techniques and photoluminescence studies a clear link between the relative molecular orientation of the DIP (donor)/PTCDI-C8 (acceptor) heterostructures and an emissive charge transfer state is demonstrated, which is ultimately associated with an efficient π-orbital overlap at the interface. Another extremely interesting organic/organic interface is the one found in organic thin-film transistors (TFTs), where the gate dielectric contains organic species such as self-assembled monolayers (SAMs). The use of SAMs opens an appealing path of research in manufacturing TFTs with the desired operating voltages, due to the observation that the threshold voltage can be modulated using different SAMs. Revealing the underlying mechanisms of this phenomenon, which is known as threshold-voltage shift, signifies a considerable challenge. Kelvin probe force microscopy (KPFM) was used as a powerful tool to explore at the nanoscale the electronic properties at the interface between DNTT and two different SAMs namely an alkly- and a fluoroalkylphosphonic acid SAM. A systematic series of KPFM investigations combined with the analysis of the transistor parameters reveals gate-oxide capacitance-dependent threshold-voltage shift as a result of interface electronic interactions at the DNTT/fluoroalkyl SAM interface. On the contrary, the DNTT transistors with the alkyl SAMs exhibit a small capacitance-independent threshold-voltage shift, associated with the intrinsic dipole-induced electrostatic potential of the SAM. 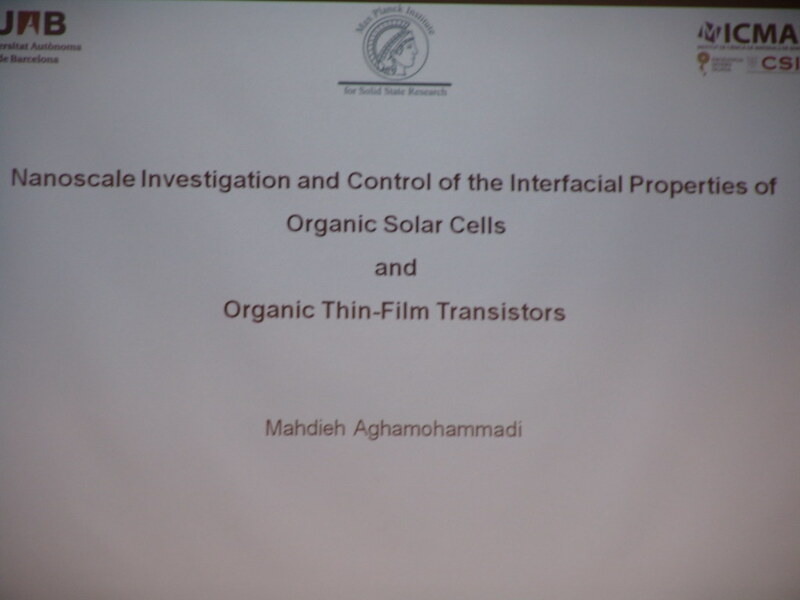 techniques, which enabled us to achieve a better understanding of different electronic processes at the interfaces involved in organic solar cells and organic thin-film transistors. This thesis emphasizes the relevance of achieving controlled interface architectures with exciting potential for future interface engineering in organic electronic devices.